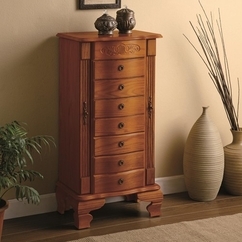 Store your precious jewelry and lingerie in one of our jewelry armoires. We have jewelry chests come in all shapes and sizes that feature unique storage for each of your jewelry items. Our jewelry armoires feature mirrors and ample storage space. All Jewelry Armoires ship FREE to the continental U.S., Ususally in 3-4 business days!